The RYOBI 3600 PSI Pressure Washer comes equipped with a powerful Honda GX200 commercial duty engine to take on your toughest cleaning jobs. The professional brass head triplex pump delivers 2.5 GPM, and an adjustable throttle allows you to set pressure to your choosing - making it ideal for any cleaning task. The 35 ft. high-pressure hose extends your reach so that you can easily access any area and the auxiliary handle increased comfort while you clean. On-board accessory storage, makes it easy and convenient to swap nozzles whenever you need to. This pressure washer features large 10 in. flat-free wheels that allow for easy transport, and a reversible handle for compact storage when the job is done. 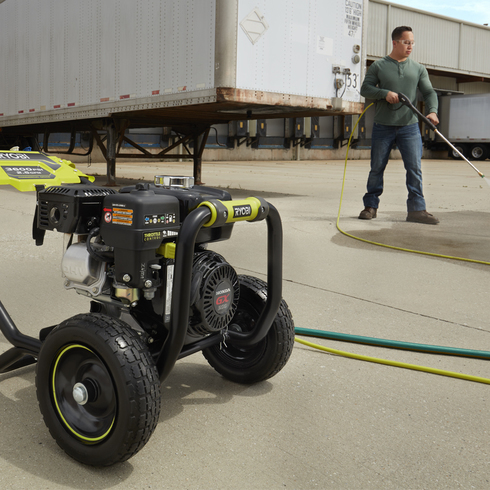 The RYOBI 3600 PSI Honda GX200 Pressure Washer is backed by an impressive 5 year unit and 3 year engine warranty.